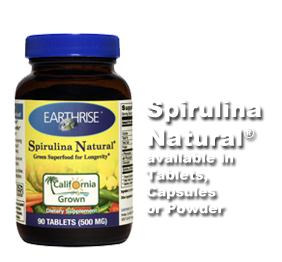 Spirulina is a microscopic spiral shaped plant without leaves, seeds or flowers, growing by the hundreds in a single drop of water. Heavily nutritious, this fresh water plant derives energy from the bright desert sunshine. Since Spirulina is a complete food our bodies are able to absorb all of the plants nutrition naturally, unlike many vitamins and supplements that only truly contribute to our bodies a percentage of the original compound because of our bodies inability to absorb the vitamin or mineral once extracted or synthesized. In other words, our bodies need to recognize it as a food to process it. I received a bottle of Spirulina tablets and a bottle of Spirulina powder. I must say, I really enjoyed the convenience of being able to take this in tablet form. The downside is that I like to practice awareness of the things I eat and sometimes I find that a little more difficult when I can appreciate the taste and other sensations involved with the experience. This is where the powder comes into play, if you have a juicer (or access to a fresh juice source) add a spoonful of the powder to the juice (or to a smoothie) and enjoy. It looks far worse than it tastes... it looks both disgusting and beautiful simultaneously. It is a dark, almost grotesque green but the spiral shapes are so lovely and wondrous. They are so tiny and plenty and that is when the appreciation for what it is really begins to sink in. The powdered form has its downside as well, it takes more preparation and if you are not feeling too hot it just isn't going to look appetizing. Spirulina has 10x more calcium than milk, 20x more beta carotene than carrots, 50x more iron than spinach and 5x more protein then eggs. This is simply a dietary staple but like anything else, everything in moderation. Too much of anything isn't good for you so make sure you don't go over the recommended daily intake or else you may end up orange from to much beta carotene. Connect with Earthrise on Facebook and Twitter. Disclaimer: I received product from Earthrise Nutritionals in exchange for my honest opinion. All opinions on this blog are my own. Book Review: The Swiss Cheese Theory of Life!